Emirates is a fast-growing international airline with one of the youngest fleets in the sky and more than 400 awards for excellence worldwide, offering fares to Africa, Europe, West Asia, The Americas and the Middle East. How to save with Emirates AU's coupons and bargains? 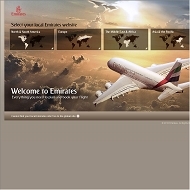 Click one of our Emirates AU coupon/bargain discount link and open Emirates AU site. Shop the Emirates AU online store. Enter Emirates AU Coupon Code (When available). Follow this link to find great special fares on a selection of Emirates routes to Africa, Europe, West Asia, The Americas and the Middle East. This coupon last tested on August 11, 2011 by BargainSmarter user. Take advantage of the Early Bird fares to 33 one-stop European destinations for travel next year, including two newest cities Lyon and Warsaw. Enjoy award-winning cuisine, unrivalled inflight entertainment plus a generous luggage allowance on the way. 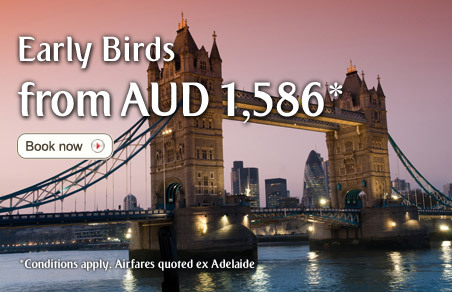 Fares start from AUD 1,586*. Get 5% off all Emirates fares in First Class, Business Class and Economy Class to any of global destinations. Sale ends at 23:59 on 21st November 2011. Special fares to India from only $1245 return. Experience the many shades of India with a choice of six destinations including Delhi, Kolkata and Mumbai. Offer ends 10th October 2011. This coupon last tested on December 11, 2011 by BargainSmarter user. Fly First Class or Business Class to over 100 destinations and enjoy a complimentary stay at a luxury hotel in Dubai. Fly Emirates to New Zealand with special fares and enjoy the luxury of 30kg of luggage, 1,200 channels of entertainment and gourmet food and wine. Book an Emirates flight and win tickets to the Rugby World Cup 2011 Final live in NZ. Special fares to over 35 destinations worldwide, including 26 in Europe and a range of cities in Africa and the Middle East. Fly Emirates from 20th January to 20th February 2011 to the Dubai Shopping Festival and enjoy an extra night when you pay for three. Rates from USD 55 per person per night. Use this exclusive Emirates AU discount link to get the latest hot deals! Click through this link for more details! Experience the world's cultural capital with our limited time offer to London from AUD 1,764*. Start your adventure in style and savour gourmet food and wine served inflight, award-winning service, 1,400 channels of entertainment on demand, and a generous 30kg luggage allowance. One-way fares also on offer. Ends 7th September.